British Prime Minister Theresa May defended her decision to delay Brexit and seek a compromise exit plan with the opposition Labour Party as one angry lawmaker from her own party stood up in parliament on Thursday and asked her to resign, Reuters reports. The European Union has agreed to delay Brexit by up to six months to Oct. 31 while May seeks an agreement with Labour that she hopes will help get her three-times rejected exit deal approved by parliament. “This is not the normal way of British politics ... Reaching an agreement will not be easy, because to be successful it will require both sides to make compromises,” May told parliament. May agreed the delay in the early hours of the morning at an EU summit in Brussels, ending the risk that Britain would leave the bloc without a deal on Friday but providing little new information on how she will resolve the country’s biggest political crisis in more than 70 years. Sterling traders were left scratching their heads about whether the British currency should rise or fall. But her statement on the decision to delay Britain’s EU exit for a second time brought angry reaction from hardliners who want to leave the EU as soon as possible. Arch eurosceptic Bill Cash described it as “abject surrender”. “Does she also accept that the Withdrawal Agreement undermines our democracy, the constitutional basis of Northern Ireland, our right to govern ourselves, control over our laws and undermines our national interest? Will she resign?” he said. 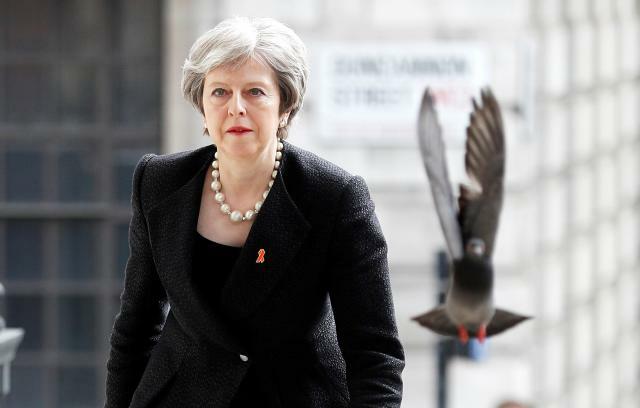 May said nothing was more pressing or vital than delivering Brexit, and emphasized that she wanted Britain to ratify an exit deal as quickly as possible to avoid taking part in European Parliament elections on May 23. Opposition Labour Party leader Jeremy Corbyn, with whom May is trying to negotiate a compromise on the shape of Britain’s long-term relationship with the EU, was critical of the need for further delay. “This second extension in the space of a fortnight represents not only a diplomatic failure, but is another milestone in the government’s mishandling of the entire Brexit process,” he said. Despite trading barbs, both May and Corbyn said they wanted to continue talks. After months of late-night votes and bitter infighting, May urged lawmakers to take advantage of a break in parliamentary business until April 23rd - announced earlier in the day to cheers - and reflect upon the country’s situation. “Let us then resolve to find a way through this impasse, so that we can leave the European Union with a deal as soon as possible,” she said. But the eurosceptics in her party were in less reflective mood, warning May that if the result of negotiations with Labour was that they were asked to vote again on an unchanged deal, they would be ready to reject it for a fourth time. “Perseverance is a virtue but sheer obstinacy is not,” said eurosceptic Conservative Member of Parliament Mark Francois.